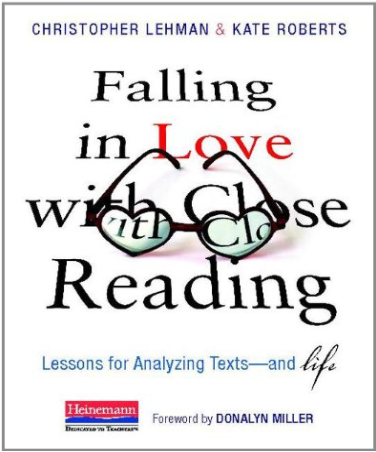 After seeing tweet after tweet, comment after comment, and picture after picture about the book “Falling in Love With Close Reading,” I decided I should follow the trend and purchase my own copy as well. I wanted to be included with all this twitter talk about the book! It arrived from Amazon quickly, and as I began to read, I’ve been thrilled by the ideas in this book. However, I often find when I read things they easily escape from my mind. I’m not the type to highlight a book, so I thought that perhaps blogging about it would give me a reference point, something to refer back to, for others to learn from as well, and maybe even start a conversation. So here we go…a summary beginning with chapters one and two. Close reading is an interaction between the person reading the text and the text itself, that happens when one makes observations about what he/she has read and then interprets and develops a deeper understanding. It involves reading a section of a text over again, thinking about what was written and looking at it through several lenses. This knowledge can then be used throughout the whole text. In other words, looking at the little details to develop an understanding of the bigger picture. When students read books or a piece of text and then respond (whether it be written, oral, or through questioning), they have an idea or question to answer and then look for information or evidence to support their belief. This limits their thinking and simplifies it. Close reading instead, encourages students to gather and organize all that information and then develop their idea from the evidence they have (pg. 12). Here is how that looks through a chart the others present in the appendix of their book. In the book they provide a fantastic example of what this would look like, through the story Out of My Mind. Through this example it was demonstrated how a student’s initial, simple idea about a character has now become deeper, much more complex, and allows students to have a better understanding. Step 2 in the chart is the key area, where students look for patterns and connect ideas together. This is where the understanding begins, and as students reread, look back, and develop new ideas via using patterning, it allows the student to develop a much clearer understanding of the story or text. Below is an example from the book as to what this could look like. The ideas covered in these two chapters are a teachers dream. This appears to be an incredible way for students to develop a deep understanding of characters and things happening in a text they are reading. 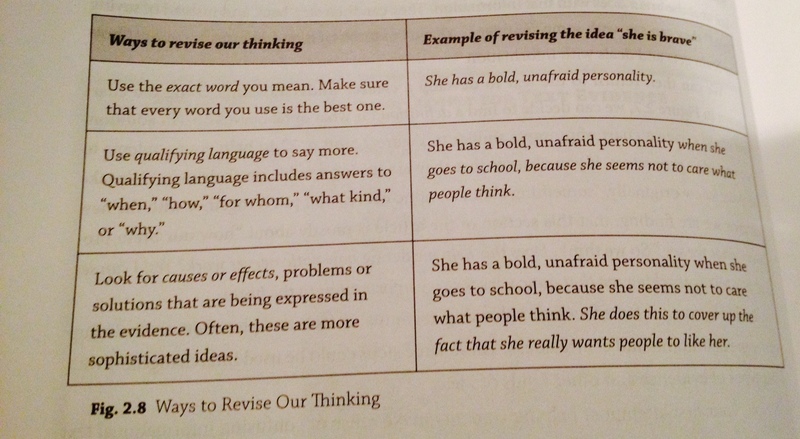 It causing them to think critically, go back and examine their initial thoughts, and develop new ideas. Although this seems like an easy task, I wonder how much modeling and “rehearsing” is needed in order to prepare students to take on such a task. At what point would the level of independence wanted, be gained? How does a teacher observe and encourage students without taking that independence away? How do you teach the skills for students to look for these connections and patterns on their own? 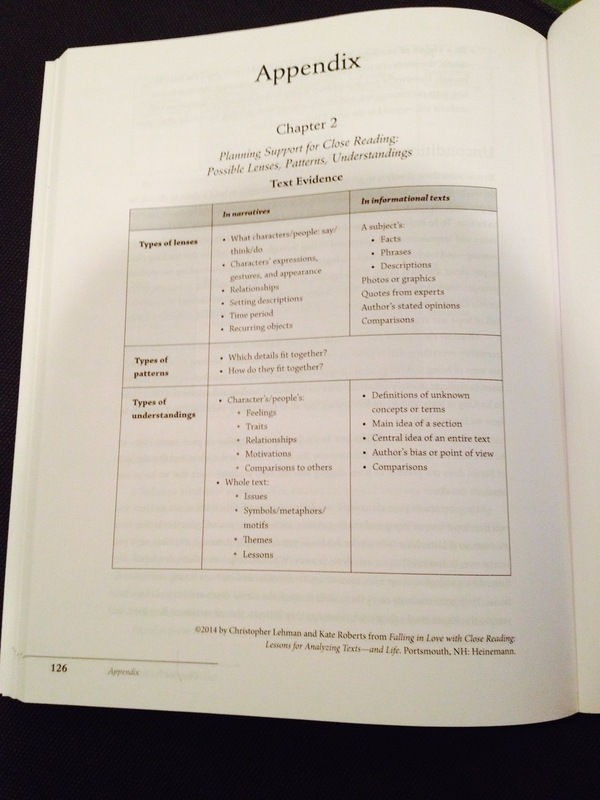 This entry was posted in Approaches to Teaching and Learning, Career Long Learners, Meaningful Learning Activities and tagged Christoper Lehman, Falling in Love With Close Reading, Kate Roberts, reading strategies, student independence by ekpetley. Bookmark the permalink. Thanks for posting about this. I have been interested in the concept, but not enough to buy the book. I will hope for more posts on this so I can learn more! It is interesting because re-reading and thinking about a fiction book isn’t really something I ever do…..and I consider myself quite a prolific reader. I wonder if my reading experiences would be enriched if I stopped and did this myself with the books I read? I think I would have to start doing it before I could teach kids how to do it or see the value of it. Seems more like “classroom reading” to me…..which doesn’t always translate to real life or create children who really love reading. Am I wrong?